Final Fantasy VIII was the first Final Fantasy I ever played all the way through. Prior to that, I had watched my brother play the domestic releases, and I had myself played enough to be familiar with the basic mechanics, so I was not a complete newbie. But I'll still always consider FFVIII to be my first. Perhaps for that reason, I reserve a special place in my heart for it. Or perhaps it was just a damn fine game that deserves attention even within the context of a stellar series full of other more celebrated installments. To follow the biggest Japanese role-playing game ever in 1997's Final Fantasy VII, Square set the same team of director Yoshinori Kitase, artist Tetsuya Nomura, and writer Kazushige Nojima to work on the next installment in the company's flagship series. For the 1999 Sony PlayStation release, Hironobu Sakaguchi served as executive producer, Nobuo Uematsu composed four CDs worth of music, and Hiroyuki Ito remained in charge of the systems. The one contributor to every numbered Final Fantasy, Yoshitaka Amano provided the logo illustration meant to convey the game's initially stated theme of love. The basic premise had a group of students from the Balamb Garden military academy fighting as "SeeD" mercenaries in a war engineered by a wicked sorceress. Previous series protagonists had barely been more than kids anyway, so the transition to a school setting seemed a fitting twist. In practice, however, the school aspects were not really played up beyond the first few hours; Balamb resembled an academy, but nobody seemed to give a damn about class. Instead, as always, Final Fantasy was about a band of skilled young fighters saving the world by beating the crap out of evil. FFVIII employed the Active Time Battle system that had been a distinguishing staple of the series since the 16-bit Final Fantasy IV, but the gameplay otherwise exhibited the most radical changes the series had seen since then. At the highest speed setting, the combat was the fastest ever, and that was just a small part of the initiative to develop a more truly "active" and action-oriented battle system. Main character Squall Leonhart's basic attack could be enhanced by pulling the trigger on his "gunblade" as he slashed an enemy. The timing never changed on this manual critical hit, so players should have been able to pick it up quickly and it would let them feel involved without inducing stress. Squall's "Limit Break" desperation attack, the multi-slashing "Renzokuken," took the mechanic further, operating as a sequence of timed button presses, and some of the other party members' Limit Breaks similarly tested finger skills and real-time awareness in ways no previous numbered installments had. Instead of featuring a Limit gauge as in FFVII, the Limit command appeared semi-randomly. The more critical a character's condition, the greater the likelihood that it would appear. There was a slim chance that it would be available even to a character in reasonably sound health, whereas, for a character in a poor state, if it did not open up immediately, the player could simply refresh the command list a few times before it came up. 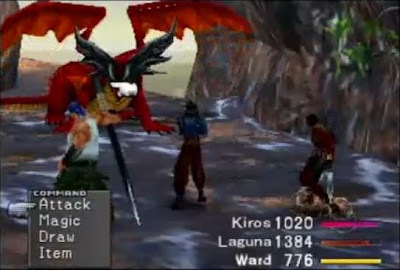 Moreover, the probability did not diminish until the ailing party member was healed, so a character could potentially perform Limit Breaks turn after turn. It was up to the player to weigh the risk of leaving a weakened character vulnerable, versus the reward of much greater offense unlocked while in a desperate state. Key to combat and character development was the "Guardian Force" system. Guardian Forces were the new summon monsters, and, similar to the Espers in Final Fantasy VI, you could "junction" a GF to each character. In addition to allowing the character to call on them during battle, the GF would grant its human partner access to unique commands and stat boosts. The phantom beasts actually had levels and statistics of their own, and, as they gained experience, they would open up new abilities. One of the more useful abilities offered by most GFs was the "Boost" technique, which allowed players to enhance the damage of a summon attack by repeatedly tapping the Square button when prompted during the long spell animation. Pressing it at other times would diminish the attack's power, so some attentiveness was required. This was by far the most effective way Square ever devised to divert players during repetitions of time-sapping summon sequences, and it boggles my mind why it was never reused. Another handy skill was the "Encounters None" ability, which, as its name suggested, turned off all random encounters. I learned it as quickly as possible and thereafter never had it off. It was not an entirely new concept, but it worked better than in previous games because enemies in FFVIII, instead of having set levels, scaled in power alongside the player characters. So, in theory, there was no point to level-grinding, because fights should only have been as hard as the party was equipped to handle. Additionally, as a member of SeeD, instead of collecting money off slain monsters, Squall received a regular stipend based around the game clock. By far the most problematic of the unique FFVIII systems was the "Draw" mechanic, whereby characters accumulated consumable spells by drawing them from enemies. Most magic had little practical effectiveness in combat, but the drawn spells were absolutely vital to character development. Levels and weaponry were relatively insignificant in advancing stats, but up to a hundred charges of a spell could be assigned to an attribute. The gain varied according to the nature and number of the spell, but you could build up a monstrous fighter fairly early on just by equipping a hundred of the strongest spell available to a character's attack. Unfortunately, the game did not provide sufficient advice on how to work this new feature, so it began as the most esoteric development system I had yet come across. Whereas, in previous games, it was well understood that a character grew stronger automatically as he gained experience, in FFVIII, a lot of manual configuration was required in order to get anywhere. Final Fantasy had previously been the more mainstream JRPG, requiring little in the way of level-grinding, but that's essentially what I found myself doing in FFVIII. Instead of battling for experience, however, I was basically farming magic, deliberately prolonging fights until I maxed out on whatever spells I could draw from the enemy party. Sometimes I would end up with 600 Float spells that I had no use for, but I was merely cautiously stocking up on everything I came across. The game provided no hints as to how strong my characters should have been at any given time, so I didn't know when to stop. Final Fantasy VIII also introduced the series's first major side game in the form of "Triple Triad." The player could challenge most NPCs to the card game, and the winner would claim a card from the loser's hand. The game was incredibly simple and linear; there was no point to playing anything but your best cards. Occasionally, opponents would attempt to complicate matters by insisting on playing with regional rules, but as long as you had the more dominating cards, winning still came easily. I mostly played only until I completed my collection of cards, and I would not waste my time with players who had nothing to offer. I learned too late that the cards could be converted into magic and items, making Triple Triad actually the most efficient way to build up a large stock of spells. Final Fantasy VIII is perhaps not as well remembered these days as some of the other numbered installments because, simply put, the story did not feature as many memorable moments. I blame this partially on the presentation. Square, at the time gearing up for production on the Final Fantasy: The Spirits Within movie, was in the process of establishing itself as a computer animation powerhouse. The pre-rendered cut scenes in FFVIII were an enormous step up from FFVII or any other title of that generation, and the game also leaned more heavily on its cinematics. The ballroom sequence was the game's most hyped scene, but, at the time, I felt it was lacking something. This was still years before they implemented voice acting in Final Fantasy, and so these cut scenes felt almost like silent movie clips. In contrast with the text-heavy real-time segments, there was zero dialogue in these movies, and not even the characters' grunts and gasps were audible. That, combined with the obvious disparity in visual quality between the real-time and pre-rendered elements, left the narrative feeling disjointed. The story was being carried consequently by moments that took the player out of the game instead of immersing them further in. The game also suffered from a cast of underdeveloped characters. Whereas previous installments had always made sure to give each party member his or her own chapter in the story, the supporting cast of FFVIII didn't really do much besides provide support for Squall, both in and out of combat. Some personality was further lost in Square's switch to realistically proportioned character models on hardware that was not equipped to render detailed faces. Nobuo also decided against composing character-specific themes. Looking back now, I can find the characters kind of cute in their adolescent teen ways. I think every JRPG player should be able to identify with Seifer, the overzealous youth playing knight. I also quite liked Irvine, the sad sack marksman who, in the story's most absurd twist, was the only one who remembered that all of the characters had grown up together years before they met again as SeeDs. The amnesia was explained away as a side effect of GF use, but I preferred to believe that Irvine was just the only one clinging to the past, never moving on and losing who he was as he grew up. Of course, the story really centered on Squall, and, for many players, that was the game's biggest problem. 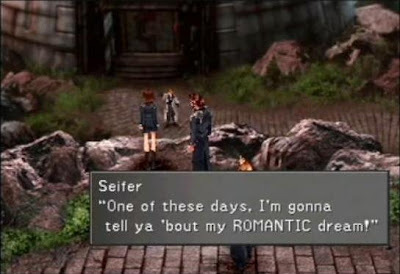 If the villainous Seifer was an unflattering caricature of the JRPG-playing dreamer, the portrayal of the "hero" Squall as a disagreeable and asocial loner rubbed a lot of fans the wrong way, either because they could not relate to it, or because they could in ways that brought to light the traits they most loathed about themselves. His dialogue consisted of a lot of "whatever," "I don't know," and "....." But Nojima added a new dimension to his character study by allowing players peeks into Squall's thoughts, offering insights into his private anxieties, although they could also be even more scathing than his speech. I did find him to be rather an incorrigible jerk when I first played the game, but I gradually came to appreciate the story Nojima was trying to tell. Squall really wasn't the badass hero that the player wanted to be. He was a young guy growing through his issues to bloom into a well-balanced human being. Maybe many players were secure enough that they didn't need to hear his story, but I imagine there were quite a few teenage shut-ins Nojima was speaking to, who might have benefited from trying to understand Squall. His journey beyond his own one-note cynicism was more real than most character arcs in the series. 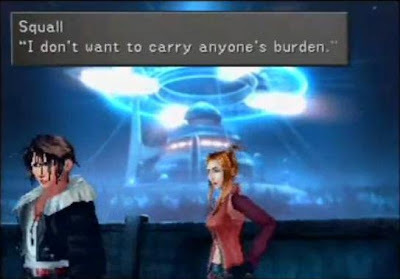 In FFVIII's defining moment, Squall carried a comatose Rinoa on his back as he walked a bridge to cross an ocean. Stopping midway through to take a breather, he sat and confessed his fears and constraints to the unconscious Rinoa. Although nobody else could hear this self-aware monologue, the entire story had been building up to this admission to himself, and I think the game pulled it off rather well. My favorite character, however, was Laguna Loire. Along with Squall, he was one of the first two characters revealed, and originally the idea was supposedly to have the player alternate between the two contrasting personalities. To some extent, that concept carried through to the final game, as Squall would periodically dream sequences that put players in Laguna's shoes. 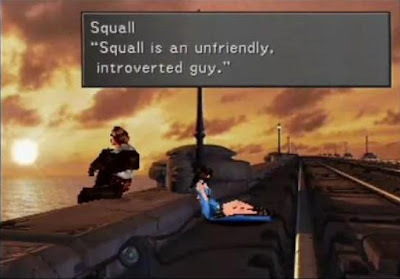 Amusingly, Squall's interior commentary remained active even during these dreams, and he was never more critical than when observing the clownish Laguna, who, the very opposite of the reserved Squall, laid it all out there at all times. It would have been easy to view Laguna as a buffoon, as Squall did, but if you were to step back and view his stories objectively, it would have become apparent that he was coping more calmly with traumatic events, including his team's near death in battle, the abduction of his adopted daughter, and the death of his wife while he was away. Squall was outwardly cool, but the thought boxes revealed the tempest within him. Laguna never sounded cool, yet his unflagging optimism was strangely encouraging, and he seemed almost unstoppable in a more desperate and barren world. Unexpectedly tying the two stories together was the series's first vocal theme, "Eyes on Me," composed by Nobuo Uematsu and sung in English by Chinese pop superstar Faye Wong. Within the game, the song was actually written by Laguna's first love, Julia, who would later be revealed to be the mother of Squall's love interest, Rinoa. Laguna and Julia never got their chance, but "Eyes on Me" would become the theme for Squall and Rinoa. It was a rather generic pop ballad, but pleasant enough anyhow. "Eyes on Me" notwithstanding, this was probably Nobuo's most understated Final Fantasy score, which was in fitting with the rest of the game. Just as FFVIII gave the player little instruction on how to play correctly, I found that the narrative rarely told the player how to feel. Characters were unapologetically who they were, the protagonist was unreliable, and there were more quiet moments than in any previous entry. This may have made it harder for players to grow attached to the world, leaving them instead feeling lost and adrift. FFVIII was not necessarily a challenging work, but it was hard to grasp because of how misshapen and half-formed it often felt. Its world was a mildly perplexing, slightly disturbing, altogether nonsensical dream. In another maybe unintentionally meta aspect, I considered that its design may have reflected the outlandish yet incomplete imaginings of a juvenile fantasy weaver, selectively filling the space with idealized yet illogical elements. The world was huge yet mostly empty, containing only a few spread out nations. That apparently couldn't stop them from hating one another, because the very existence of the mercenary force SeeD, which had almost as many locations as there were countries, suggested that war was an ever-present element. Characters would behave irrationally, as when Balamb's students inexplicably elected Squall their leader, even though his personality should have rendered him the least likely candidate. It was some sort of wish fulfillment fantasy, but presented in such a brazenly incoherent manner as to highlight the foolishness of the fantasy in the first place. 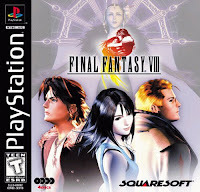 One of the most anticipated video games of all time, Final Fantasy VIII was hugely popular in its day, and it's a testament to its quality that, despite the incomparably passionate nature of its predecessor's followers, the game has never faced the sort of mass antipathy that typically characterizes any discussions of, say, Chrono Cross or Metal Gear Solid 2: Sons of Liberty. Perhaps, because FFVIII was not actually a sequel to VII, those disappointed were more comfortable just ignoring it. While there has never been any strong anti-FFVIII sentiment, the game also does not enjoy the ardent fan bases of VI and VII. I won't say that VIII was a better game, but I think it was a good and important one, and I increasingly find myself wishing that more JRPGs would follow its lead. The battle system was the most fun and action-packed of any turn-based RPG I ever played. With its enemy-leveling and "Encounters None" option, it was the only game I can think of to almost fulfill my long-held request to do away with non-boss encounters. Although I earlier accused the game of lacking "moments," this was a story where the characters staged a concert, starred in a movie, flew to outer space and back, and traveled forward and backward through time. So, yes, there was some cool stuff in there. And the fifteen-minute pre-rendered ending remains, in my opinion, the most satisfying in the series.